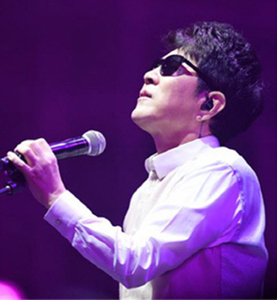 Veteran singer Cho Yong-pil is sweeping the music charts with his 19th album "Hello," generating an enthusiastic response from all generations. Having debuted 45 years ago, he released his first full-length album in 10 years in a showcase in Seoul on Tuesday. Fans flocked to music stores across the country from early in the morning to get hold of a CD autographed by the singer. The moment the songs were released online at noon, they swept almost all music charts here. Some 20,000 copies of the album sold out within three hours of its release. 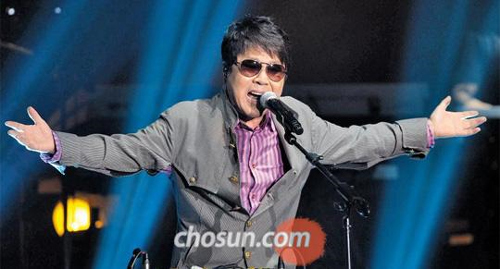 Cho Yong-pil performs in front of over 2,000 fans in a showcase for his new album in Seoul on Tuesday. At a press event ahead of the showcase, Cho said his heart is "bouncing," alluding the title of a new song. Cho's wife died while he was working on his last album in 2003, and he felt unable to go on making records. It was not until 2011 that he began works on the latest album. He said he tried to depart from his usual style because he felt confined by it. The star could be said to be a forerunner for the Korean Wave in Japan, where he was popular in the 1980s. Friends were concerned that his album was released so hard on the heels of global star Psy's new single, but Cho said he is proud of the rapper and glad that he and Psy took the top two spots in the charts. Cho starts a concert tour in Seoul on April 31.